This month’s If You Got Ears with Charlotte Loseth from Ssurfacing has been an ethereal journey. Tune in tomorrow from 12-2pm for another episode of ‘c a l m’, where you’ll hear a selection of ambient and meditative sounds. Check out some of Charlotte’s music here, and for more information on the Montreal Sessions you can visit the CKUT website. This entry was posted in CKUT programming and tagged c a l m, Charlotte Loseth, If You Got Ears, Montreal, Sea Oleena on June 16, 2015 by librarian. In the mood for some relaxation? Charlotte Loseth from Ssurfacing has got your back. Tune in your souls for a gentle session of If You Got Ears, ‘c a l m‘ edition, today from 12 till 2pm to hear a selection of ambient and jazz sounds. For more information about Charlotte and this month’s show, see our website. 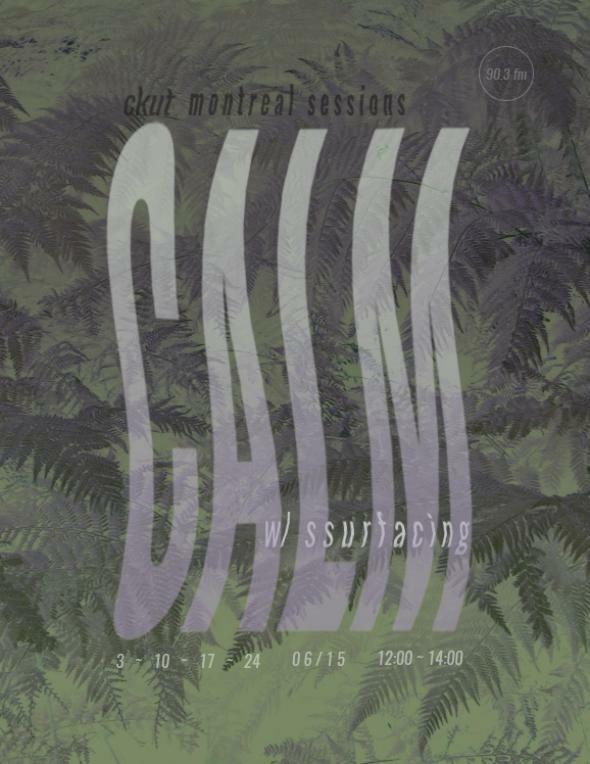 This entry was posted in CKUT programming and tagged ambient, c a l m, If You Got Ears, Jazz, live, Montreal, ssurfacing on June 10, 2015 by librarian.